Need a holiday sanity saving tip? I buy or rather MAKE the same gift for as many friends and family members as I can. Two years ago, I made aprons and last year I made potatoe bags. Each year we make several different kinds of cookies too. I have been making these Andes Mint Cookies for over 20 years. To download the recipe click HERE! Looking for a quick holiday project or handmade gift? These will be a favorite! Sounds so great! Not sure if I will find some andes mint here. So have to think what I could use instead! Will see! Thanks so much! OOh Andes mints! I always thought a restaurant who would give out an Andes mint after dinner must be the height of elegance. Oh Wow! I love mint! I will have to try these! Thanks for sharing! Andes mints in a cookie - sounds delish! Thanks for sharing all of the cookie recipes! Andes mints in a cookie yummy in my tummy. I am making pot pinchers for everyone I know. It takes all the guesswork out, you are so right! thanks for the recipe. I wanted to make these last year but ran out of time. WIll be able to try them this year . A family member used to make Mint Cookies until we couldn't get the Starlight Thin Mints any longer. I love Andes Mints so I'm sure these will be just as good as her's were. Oh, mercy! Those sound good! Andes mints are my fave. These are definitely coming from my kitchen this year! Haven't had one of these cookies in years. Might just have to make them for Christmas Eve this year. The kids will love them! When I make these they will last about 5 minutes in my house. Thanks! These sound oh so good! Thank you for sharing! Looks like a great recipe...I love Andes mints!!! Just wondering...what is a potatoe bag? Seriously, I've never heard of one! Love the recipe. I like the idea of making the same thing for everybody then I wouldn't have to remember what I bought everyone from year to year. Nice block! Love the orange!! The recipe sounds yummy, too! Will have to give these a try, thanks for the recipe. 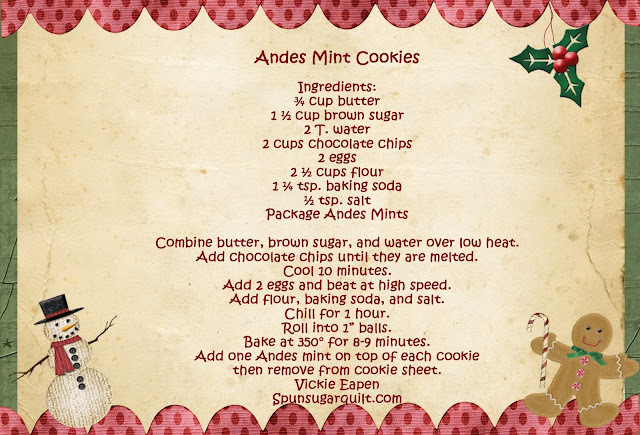 I love Andes mints.....so, I will be giving your cookies a try. Thanks for sharing! I have to make these for my son. He just loves Andes mints. Thanks so much. And I like the idea of making multiples of gifts. Works for me! I love mint....putting these on my to-do list! Delicious! Each year, I've been paring out who I make things for, and who receives Christmas Cards ... :) My daughters are now 4 and 6 ... I'm facing reality :) lol Thanks for sharing! Andes Mints are my favorite. Thanks for the recipe. Great recipe and your blog looks interesting. I've bookmarked it to peruse later. This is such a good recipe! I know I will LOVE these cookies!! Andes mints are just the best. I make similar gift, too. Really saves time! This is a new recipe for me. I'll definitely be trying them. Thank you. Andes mints sound like a gret cookie ingredient. Can't wait to try them. Can't wait to try the recipe...sounds wonderfully tasty! These cookies sound so good! Andes mints are the best! Thanks! What a unique cookie! Thank you. I love Andes Mints. Can't wait to try your recipe. Sounds yummy. Thanks! My son's favorite candy. I have to make these for him. Thank you for the recipe. I have GOT to make these! LOVE Andes mints ... why haven't I seen this recipe before ?? Thank you, thank you, thank you!! This is a "new to me" recipe. Thanks. I like your idea of gifting the same item to many people. Keep life simple! I try to do the same thing when I make gifts. Just different colors for each person! It is a time saver. We aren't a chocolate family..but so many of my friends are..I will surprise them this year with this recipe.Thank you.